The Attack is a powerful, must-see film for those of us interested in Israel and its conflict with the Palestinians. I enjoyed meeting the Lebanese filmmaker, Ziad Doueiri, and wrote of his evolution from hating Israelis into someone who could appreciate both sides of the divide. Sadly, the fact that he depicts both sides realistically and filmed in Israel, working with Israeli-Jewish actors and crew (as well as Palestinians in Israel and the West Bank) has subjected him to vilification in the Arab world, where his film has been banned. Interestingly, Doueiri knows the writer, Yasmina Khadra, who wrote the novel of the same name from which the film is drawn. Both currently live in Paris, where they occasionally get together socially. It turns out that Khadra is the nom de plume for Mohammed Moulessehoul, a former Algerian army officer who wrote under his wife’s name while still a professional soldier. When he retired, he found it convenient to continue to write as Khadra, because he had already established a reputation with that name. Doueiri said that Khadra was initially upset that he had changed the ending of his book, but is now okay with it. The film is not obvious about the exact time period of the eponymous attack, but there was an attack by a woman suicide bomber on a restaurant in Haifa, similar to the pivotal incident of this story, in which the bomber actually exploded herself near young children. The film comes closest to placing itself during the Intifada in a scene in which the main character, Dr. Amin Jaafari, views the destroyed remains of the Jenin refugee camp where the IDF battled Palestinian fighters. This scene implies that there was a “massacre,” as widely claimed and believed. But the truth is much less clear. Human Rights Watch investigations found ‘no evidence to sustain claims of massacres or large-scale extrajudicial executions by the IDF in Jenin refugee camp’[,] although they reported that ‘Israeli forces committed serious violations of international humanitarian law, some amounting prima facie to war crimes.’ The accusation of war crimes was repeated by Amnesty International. Human Rights Watch estimates that between 53-56 Palestinians were killed during the Israeli offensive, just over half of them suspected to be armed combatants. Israel concurs that around 50 Palestinian died, but describes the event as a battle and blames civilian deaths on the close proximity of fighters and civilians. 23 Israeli soldiers died. The book begins and ends with a bloody Israeli attack in the middle of Jenin, which is completely excised from the plot of the film. 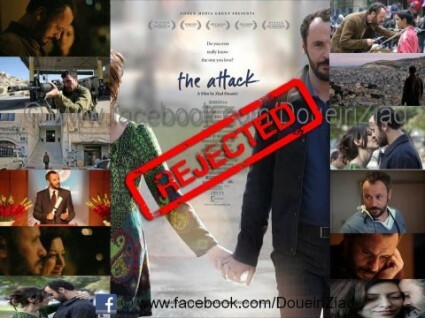 Its inclusion might have made the movie more palatable to Arab audiences, but this might also have obscured the filmmaker’s focus upon the way in which the main character — a Palestinian of West Bank origin who is a naturalized Israeli citizen and a highly regarded surgeon living and working in Tel Aviv — has his life and sense of identity shattered by another violent event. The central conflict within the main character is further accentuated by the filmmaker’s decision to keep his friendship with Kim, a Jewish colleague at the hospital, non-romantic. Indeed, she is more ordinary in the film than as described in the book. In fact, Doueiri confided that there’s a scene they ultimately deleted toward the end where Kim shows a clear desire to get close to him physically, only to be rebuffed, with her lashing out at him as a result. Doueiri and I agreed that a romantic subplot with Kim might have undercut the main drama of the story: Amin being left bereft and alone, without his loving wife and without his sense of place in either Israeli or Palestinian society. Sihem, Amin’s wife, is portrayed as Christian in the film, rather than Muslim as in the book. Doueiri explained in a radio interview that he wanted to emphasize that the conflict is national and ethnic rather than religious. A further change is more incidental: Doueiri set scenes in Nablus, written by Khadra as occurring in Bethlehem, simply because he found Nablus more interesting to film than Bethlehem. I have not seen the film, but just reading this article ,I get the sense of confusion from the real book story and the intention of such film. Why is that? Was it intentional, or there is another message that this film maker wanted to convey? If so, what is the message, that most of us don’t know about the nature of the Israeli occupation of the Palestinians? Is there another one beside wars and oppressing people is in humane and ugly, and we need to rise from this old uncivilized forms of blatant aggression against each other? Isn’t about time for us all to see that it is not Ok if you have the arms and the power to steal and occupy other people homes and land , then masscar them if the don’t submit and resist? There is something clearly is very wrong in this situation of Palestinians/Israelis/Jewish/Muslims and Christians,land graping massacreded in many masks to hide its nature. It does not sound like this film have done anything gods to clear and ease this situation. If any one have seen it and came out with something good,please tell. It’s interesting that the most resonant implications of the book – I’ve yet to see the movie which is in very, very limited release – are the Boston Marathon bombers, and none of the reviews – particularly this one – see any generalizable implications. Those implications vibrate with Hannah Arendt’s “banality of evil” which, in this conflict, affects both sides – in different ways, at different times, but just as powerfully as they did for (and against) the Nazi’s. When suicide bombers are among us, how can we be safe? It is inappropriate to imply that the now discredited “massacre” in Jenin justified her terrorist attack, and therefore justified Amin’s alienation from his assimilated life in Israel.